The new year is blooming and we are all set to accomplish our new year resolutions. one of our resolutions would be looking beautiful with fewer efforts. 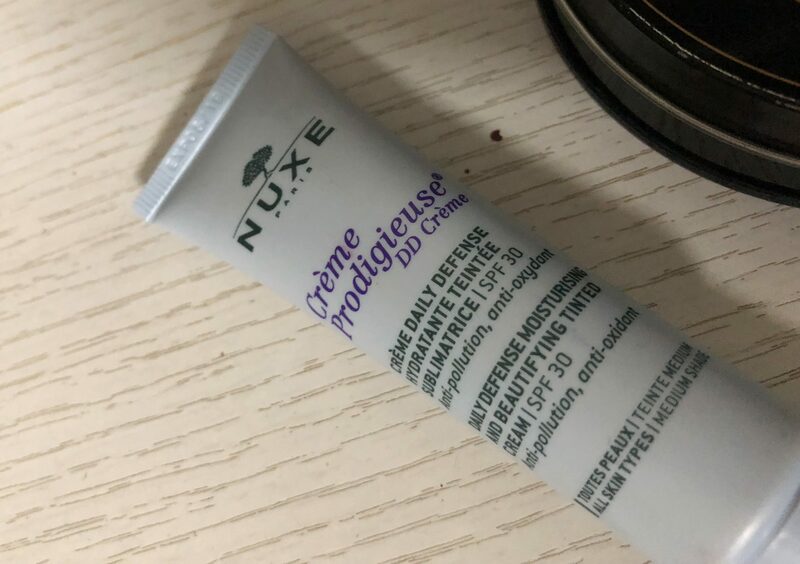 Today I am reviewing the Nuxe Creme Prodigieuse DD Creme Medium. Apply Nuxe Creme Prodigieuse DD Creme in the morning with or without moisturizer on your face. Nuxe is the organic brand from Paris which make cosmetics from pure ingredients. Nuxe Creme Prodigieuse DD Creme is one of the tinted moisturizer available in 3 different shades, Light, medium, and dark. The founder says It is SPF 30 Creme with boosting radiance. DD Creme says it’s daily defense cream, so you can use it on daily basis with or without moisturizer. DD cream is something different from CC and BB cream. It has a thicker texture than BB cream. I visited Dubai Mall in November on my Dubai trip. After seeing Sephora, I can not stop myself from trying new cosmetics. I was not aimed to purchase some specific products. But the lady at the counter of Nuxe Paris about 50+ in the age made me by this super organic and multi protector DD Cream with some exciting offers. I got two products of Nuxe Paris as complimentary with the Nuxe Creme Prodigieuse DD Creme. This was a superb deal which I got from Sephora. I will review these both products after reviewing dd creme. I had purchased medium shade of Nuxe Creme Prodigieuse DD Creme. This DD Creme is made from natural ingredients like the Everlasting flower, shea butter, and white tea leaves. The packaging of Nuxe DD Creme is so ravishing, it is a powder blue tube. I have used this creme on regular basis after applying little moisturizer. It has light and creamy texture, It gives dewy look to my face. Nuxe Paris claims it to be a ‘tinted moisturizer’ but I would rather prefer to entitle it as ‘Light foundation’. Even you would not feel any dryness on the skin without using moisturizer. The medium shade of Nuxe Creme Prodigieuse DD Creme will look as shown in the image. The shade will look bit darker in swatch when we dispense the product from the tube. but It blends magically in my skin and leaves it hydrated, plumpy and glowing. Hurray, mattifying effect with little bit glow is clearly visible. Additionally, Its SPF 30 so it protects from UVA and UVB rays too. 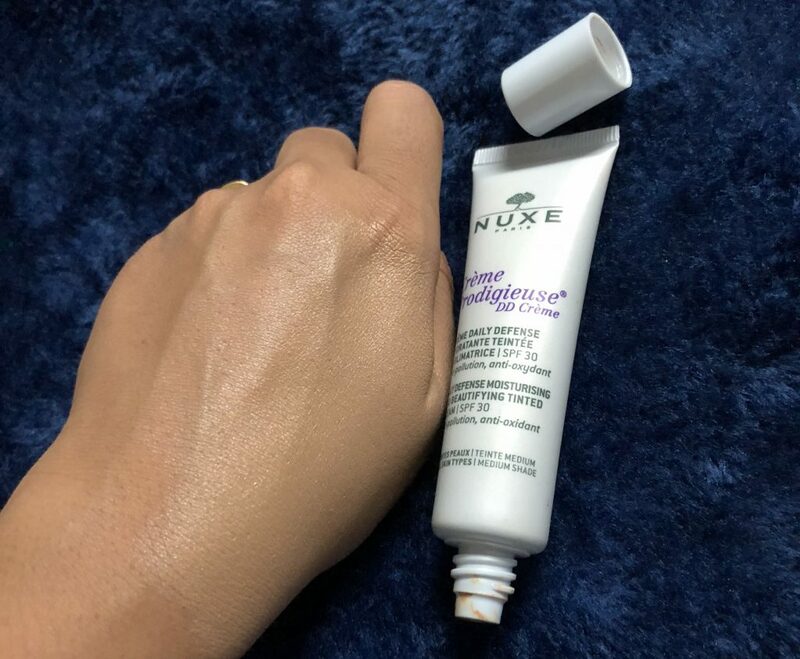 Nuxe Paris has designed this DD Creme that suits all skin types. 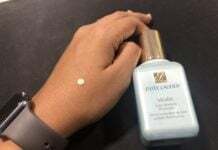 I have received this product complimentary with Nuxe Prodigieuse DD Creme. It is a cleansing water which can be used as a mild makeup remover and as a rosewater too for freshness. This cleansing water has a subtle fragrance of rose and a bit creamier texture. It is nourishing and hydrating water which can be used for sleep time and It leaves your skin soft and supple. So all and all, Nuxe Paris Prodigieuse DD Creme is clearly a winner for me with these eye-catching offers. Would you recommend/repurchase Nuxe DD creme? A big yes for all the gorgeous ladies out there, who want to have no makeup look with some mattifying skin effect, this is the perfect product for you. Try your luck at Nuxe Paris and grab the deal to have the dreamy look every day!